Just two months after her re-election to a second term, Argentina's popular president, Cristina Fernandez de Kirchner, 58, has thyroid cancer. With early detection and treatment, the survival rate is high, and Kirchner's prognosis is good; the cancer hasn't metastasized or spread to her lymph nodes. She plans to step away for about three weeks starting next week. 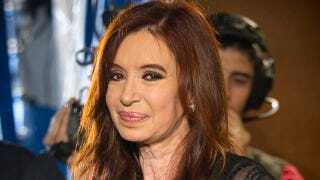 Her husband, former Argentine president Nestor Kirchner, passed away last year after a heart attack. And, if you're a student of international politics and/or cancer diagnoses, the BBC offers a helpful rundown of all the Latin American leaders who have been diagnosed with cancer in the past few years: Venzuela's Hugo Chavez, Fernando Lugo of Paraguay, former Brazilian president Luiz Inacio Lula da Silva, and current Brazilian president Dilma Rousseff.